This is a review of the supplement Cerebral Charge. This product claims to enhance attention, creativity, memory, concentration, and focus. It also plays a significant part in promoting working memory and supporting stress management. Read further and you will learn more about this product. L-Tyrosine- effective and safe amino acid that stimulates brain function. GABA (gamma-aminobutyric acid)- neurotransmitter that mediates neural activity. Phenylethylamine (PEA)- natural chemical found in the brain. Its functions include promoting euphoria and pleasure, stimulating the CNS, and influencing mood, wellbeing, and appetite. Alpha GPC– increases the levels of acetylcholine (AC) in your brain. L-Theanine- plays a vital role in providing the body with a sense of balance and calmness without obstructing neural activity. Vitamin B12- among the most important vitamins in the body. It plays part in numerous chemical reactions. We did not find any information about dosage. However, the manufacturer warns persons below 18 years against using this product. Moreover, you should not consume this product if you are nursing or pregnant. Ask for assistance from a doctor if you are nursing, pregnant, sick, or under medication. Stop using if you are about to undergo surgery. Users are warned against exceeding the recommended use. There is no information about the possible side effects. However, the manufacturer warns against improper use because it can lead to poor results. A single bottle with 60 capsules costs $19.95. The shipping cost is $4.95. This is a one-month starter package. You can also purchase the popular package that consists of 2 bottles for a two-month supply. This package costs $39.90 and has no shipping cost. You can also take advantage of the value pack that consists of 3 bottles for a three-month supply. This package costs $59.85 and shipping is free. You also get a free bottle of the product. One attractive feature about this product is the 100 percent satisfaction guarantee offered by the manufacturer. You can return the product within ninety days and receive the total purchase price if you are not satisfied with the results. A satisfaction guarantee is a sign of quality, which plays a major role in attracting consumers to purchase the product. Customer reviews reveal that most of the customers are satisfied with the product. 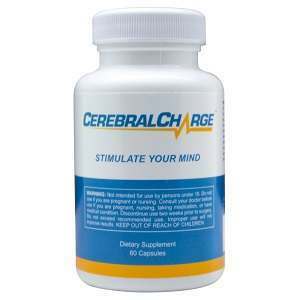 Cerebral Charge is a suitable product for enhancing attention, memory, concentration, and focus. Users can also trust it to manage stress and improve working memory. A major merit of this product is the strong formulation consisting of scientifically proven ingredients. Furthermore, a satisfaction guarantee assures that you will realize the value of your money. Positive customer reviews give another reason why this is the ideal product for you. The major drawbacks include the relatively low price of the product and the lack of essential information about dosage, as well as the possible, unmentioned, side effects. Henry Costa	reviewed Cerebral Charge	on June 29th	 and gave it a rating of 4.